If I could eat just one type of food in my life it would have to be anything Asian. I know that it’s not the best answer from a Colombian food blogger but I can’t help it, give me anything Chinese, Japanese, Vietnamese, Thai, and I’m a happy girl. I could eat it everyday for breakfast, lunch and dinner and I’m sure I would never get tired of it. I love eating sushi, egg drop soup, fried rice, noodle bowls, any kind of roll whether fried or not and stir fries, I sure love me a good stir fry. 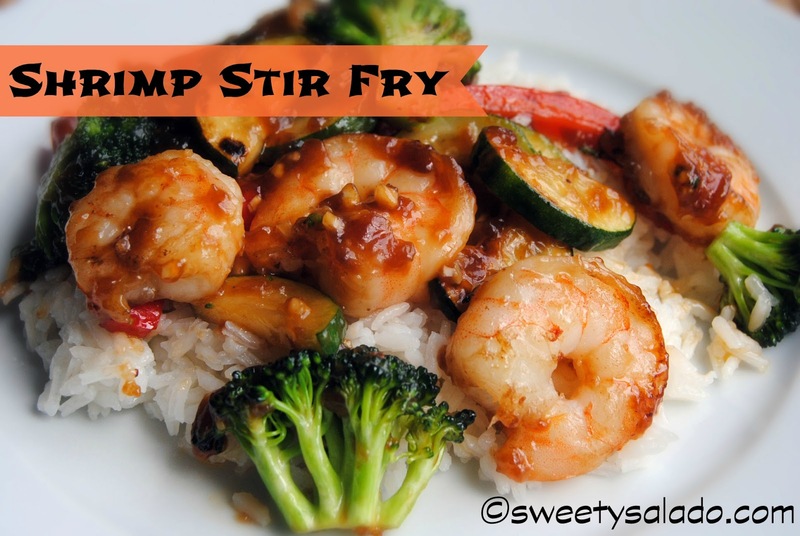 So, that’s why I’m sharing the one stir fry recipe I make the most at home, shrimp stir fry. It’s not only easy to make but it’s also pretty healthy, you get a good amount of vegetables and a nice dosage of shrimp and rice, whether it’s white or brown, it’s up to you. Plus, it takes just minutes to make, in less than 20 minutes you can have a nice, delicious meal on the table. Oh, and if you don’t like shrimp, don’t worry about it, you can substitute it for any other protein including, chicken, beef or pork. Or just skip the meat part altogether to make it a vegetarian dish and use any kind of vegetables you want. No matter how you decide to make it, it won’t disappoint. By the way, using oyster sauce, soy sauce, dry sherry and cornstarch is the basis for most stir fries. Just put them together to make your sauce, add some veggies and any kind of meat and you’re set. 1. Wash all your vegetables. Cut the red bell pepper into strips and the broccoli and zucchini into small pieces. Wash shrimp with cold water and dry them well with paper towels. 2. In a small bowl mix the oyster sauce, soy sauce, dry sherry, sesame oil, garlic and cornstarch. Mix well and set aside. 3. Heat a large pan or wok at high heat. Add one tablespoon of oil and stir fry the vegetables for about 2-3 minutes. Put a lid on leaving a gap to steam them for about a minute. Remove the vegetables and set aside. 4. Heat the remainder tablespoon of oil in the same pan or wok and add the shrimp. Cook for about 3 minutes until they turn pink. Lower the heat to medium, add the cooked vegetables and stir fry for another minute. 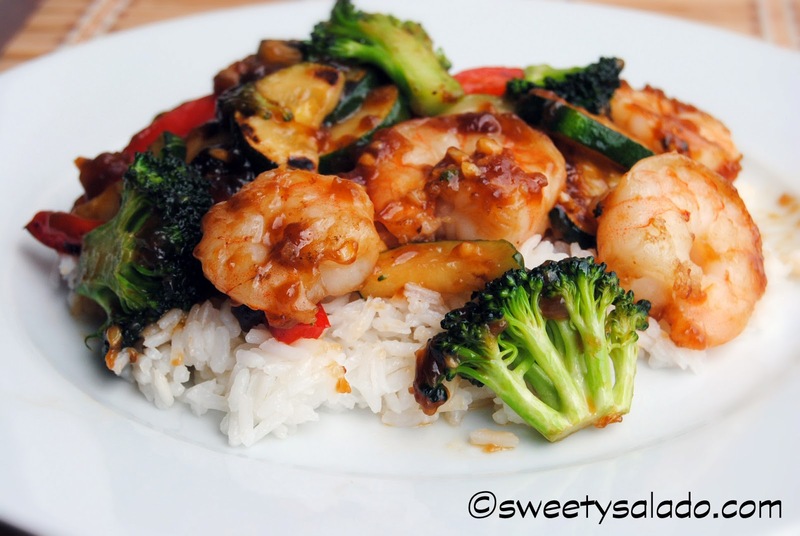 Add the sauce and stir fry to cover the shrimp and vegetables thoroughly. Serve immediately on a bed of rice.